Are you looking to catch a little glimmer on your Christmas stocking? 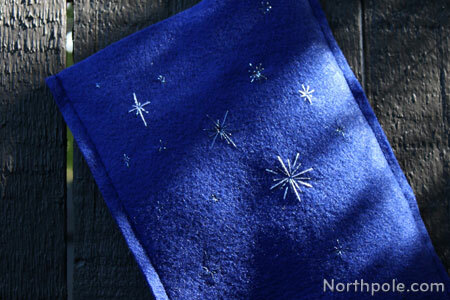 The metallic, hand-sewn stars twinkle and glisten against the dark blue felt of this stocking. Elegant and subtle, this stocking has the right amount of sparkle. 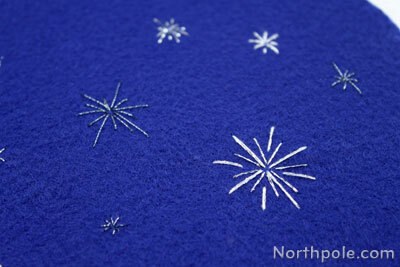 To create a variety of stars, we used three different types of sparkly thread, as listed in the supplies below. *If felt fabric is 72 inches wide, you only need 0.25 yard. If felt fabric is 36 inches wide, you will need 0.5 yard. A print window pops up. Under Pages & Handling, select Poster. Change Tile Scale to 200&percnt;. Select checkbox for Cut Marks. Now click the print button. Piece the pages together, using tape as needed, and then cut out. If needed, iron the felt on low heat to remove any wrinkles. 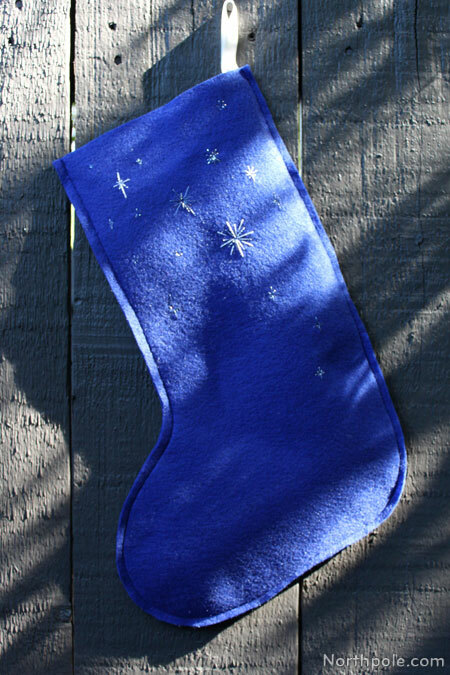 Pin the stocking pattern to dark blue felt and cut out 2 pieces. 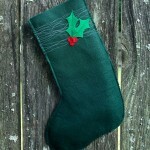 Take one stocking piece and embroider several stars with white, silver, and blue embroidery floss. 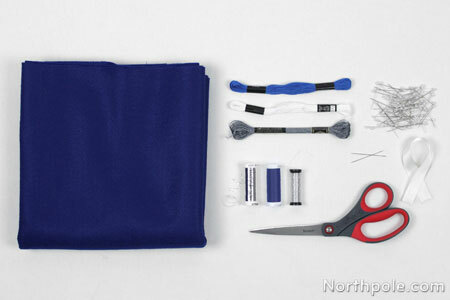 Cut a piece of embroidery floss that is 15" long and separate a single strand from the cluster. Set the remaining strands aside. Optional: Cut a piece of blending filament that is 15" long and combine with the embroidery floss to make the white/blue floss sparkly. Tie off the ends on the back side of the felt and trim the thread. Make a variety of stars by elongating the “+” or by adding more arms. Set this stocking piece aside. Cut a 6.5" long piece of ribbon. Then take the ribbon, fold in half and pin in the upper right corner of the other stocking piece about 3/8" from the side edge with 1.5" sticking out above the top edge. Sew the ribbon in place. We sewed straight stitches on either side of the ribbon (to hold in in place), removed the pin, and then sewed a zigzag stitch down the middle. Now, stack the 2 stocking pieces together and pin in place. 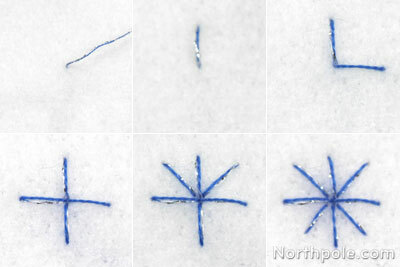 Sew along the outer edge with blue thread about 0.25" from the edge. Be sure to backstitch at the beginning and the end to secure the ends. Trim loose ends of thread. Now that your stocking is finished, hang it up for Santa to fill!